Testing has begun of a new gas pipeline between Norway and the UK, which will provide 20% of Britain's peak gas demand by the end of 2007. The first commercial deliveries of gas through the 750-mile Langeled pipeline, whose British terminal is located in East Yorkshire, will begin next month. Its completion and December's opening of a pipeline from the Netherlands has eased fears of shortages this winter. Wholesale prices quadrupled last winter amid soaring demand for gas. This followed a fire at the UK's main gas storage facility and colder than usual weather in November and March. With prices having risen 250% over the past three years, the National Grid, suppliers such as Centrica and regulators are keenly aware of the likely pressure on supplies if this winter is similarly cold. Regulator Ofgem has warned that supplies to intensive energy users could be disrupted if temperatures plummet this winter even though new supplies becoming available could boost overall capacity by 10%. The Langeled pipeline will pump gas from northern Norway to Easington, where it will enter the National Grid's transmission network. The £1.7bn project has been backed by Centrica and energy giants Statoil, Norsk Hydro, Royal DutchShell, ConocoPhillips. Once the Ormen Lange field off northern Norway becomes operational next year, a major new supply of gas will become available to the UK. "This could be the start of the UK turning the corner in terms of gas supplies," a Centrica spokesman said. 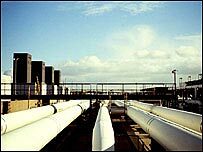 Supplies via the interconnector - a strategic gas pipeline linking the UK and Belgium - are also set to expand from 48 million to 63 million cubic metres a day later this year. Claims that the interconnector was not operating at full capacity last winter and that European energy firms were limiting export supplies in order to force up prices caused fierce controversy.